“Bush Women: 25 Years On” showcases works produced by six senior Aboriginal artists from WA’s Kimberley region and the Ngaanyatjarra Lands of the Western Desert: Paji Honeychild Yankkarr, Daisy Andrews, Queenie McKenzie (Gara-Gara), Tjapartji Kanytjuri Bates, Tjingapa Davies and Pantjiti Mary McLean. These works were first collectively exhibited in “Bush Women: Fresh Art from Remote WA”, a pivotal group show held at the Fremantle Arts Centre in 1994. In what was clearly a huge undertaking, the Centre’s exhibitions team has successfully tracked down and reunited nearly half the works that featured in the original show 25 years ago. The paintings in “Bush Women” span very different styles, from the hypnotic, shimmering dots of Tjingapa Davies, to the thick, gestural brushstrokes of Paji Honeychild Yankkarr, and the hand-ground natural pigment powders made and used by Queenie McKenzie. These compelling works, produced by women who all started painting later in life, have clearly retained their vibrancy and significance. Pantjiti Mary McLean’s sketches and paintings have been hung salon-style to produce an engaging and dynamic wall of works. Her idyllic campsite scenes project a sense of joyous energy, with expressive human figures crowding amongst bountiful niri niri (bush tucker). 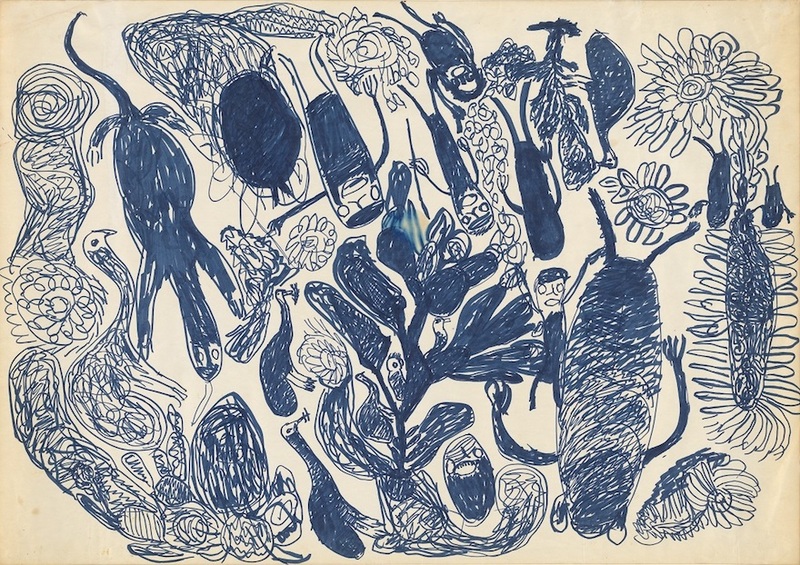 Pantjiti Mary McLean, ‘Yultukunpa tjikini’ (drinking honey Grevillea) (detail), 1990, felt pen on paper, 60 x 84cm, Collection of the National Gallery of Australia. As if to emphasise the distinct aesthetic approaches of each artist in “Bush Women”, McLean’s works strongly contrast against the art of Queenie McKenzie found across the room. A traditional law woman and community activist, McKenzie was forced to depict her ancestral lands from a distance, after all Aboriginal people were denied entry to a station built on the site. Her stylised topographies are full of personal symbolism, with minimalist landmarks sitting on flat monochromatic fields. McKenzie’s Horse Creek Massacre (1880s), a screen print accompanied by a didactic panel of stories from local oral histories, is particularly haunting. The comprehensive wall labels throughout “Bush Women” provide fascinating biographical information about the artists, many of whom spent their childhoods living traditional nomadic lifestyles. Detailing the language, family heritage and birth place of each artist, these texts also share the often painful details of the artists’ first interactions with Kartiya (Europeans) and the subsequent dramatic upheaval of their lifestyles and landscapes. The exhibition labels, additionally, provide a helpful amount of supplementary information to enhance our understanding of the painted imagery. Depending on the painting, the accompanying wall text outlines the lessons and events of the Tjukurrpa (Dreaming), the cultural knowledge, or the characteristics of each artist’s Country that they have chosen to represent. The provenance of some paintings is also explored, from the collectors and staff who purchased the works after the original exhibition, to the physical journeys of the paintings (one work travelled from Fitzroy Crossing to Broome to Sydney to Perth). The restaging of “Bush Women”, curated by Erin Coates (the Centre’s special projects curator) and John Kean (original curator of the 1994 exhibition), reaffirms the ongoing significance of these diverse paintings and the stories they share. It feels like a privilege to experience these works reassembled in such a deeply engaging survey show. 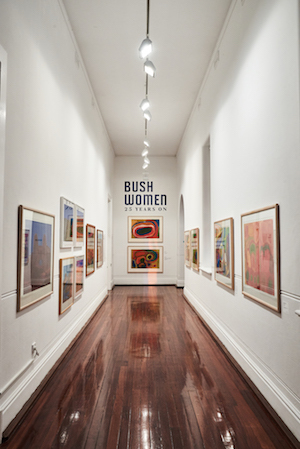 “Bush Women: 25 Years On” runs until 8 September 2018. Pictured top: All works by Queenie McKenzie (Gara-Gara), “Horse Creek Massacre (1880s)”, 1998, screenprint on paper, 91 x 108cm, “Garloomboomy, Ngamany the Borders of Gija Country”, ochre on canvas, 96 x 120cm, “Jesus, Mary & Joseph”, 1998, 46 x 61cm, “Barramundi”, ochre and bush gum on board, 45 x 56cm, “Ninteramangy (Learning in All)”, 1995, 80 x 120cm. Photo: Rebecca Mansell.